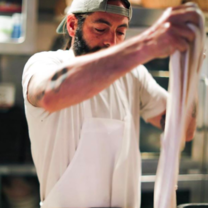 Yoni Levy is the chef de cuisine for The Ohana floors at Salesforce San Francisco. He attended the Culinary Institute of America in Hyde Park, during which time he externed at Bradley Ogden’s One Market in San Francisco. He worked at various restaurant in Boston and Chicago before moving back to the Bay Area to work at flora in Oakland. 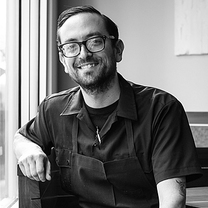 He then opened Alta ca as chef, before leaving for the executive chef position at outerlands. Yoni is currently working for chef Bill Corbett at Salesforce. Join Chef Yoni Levy for an off-the-clock stop at a famous local deli, then claim a perch by the sea—all for that one moment of stillness in between chef duty and dad duty. "I lived in Chicago for 7 years. I ate Chicago dogs every week. This one is the real deal. These dudes killed it." "Oh my god. The lengua. New favorite spot. #sunday"
"I love luenga and theirs is especially delicious." "Everyone here is so warm and inviting. My wife and I got an assortment of breads, and we cant stop eating it. Well crafted and delicious. We also love the hot cross buns they have for Easter." "I am pretty sure that chef Ravi will take over the world with this spam. I love everything about it. The texture and flavor is right on. I have never had a better version. The dish as a whole is so comforting and makes me really happy when I eat it. Every now and then you have to close your eyes when you take a bite from a dish—this is one of them for me." "I am pretty sure that Ravi will take over the world with this spam. I love everything about it." "Yesterday’s Marbled Rye Ode to @richardhartbaker"
"Those 50% whole grain Spelt 50% whole grain yacora. Trying to bake like @elmoremountainbread"
"This bread has only organic flour, water, salt, and levain (also know as a young wild yeast) so simple but with proper fermentation and guidance it can be sweet, tender, full of flavor, and nutritious." "Fried chicken tender sandwich. Mayo. B&B pickles. House made hot sauce. Shredded lettuces. Outerlands bread #🌭party"
"Beautiful day but still hot cider times with @lsloss"